Right next to the original moat of Hereford Castle. Highly recommened food from head chef Claire NIcholls. Much of the produce comes from the owner's farm. Some suites have garden access. 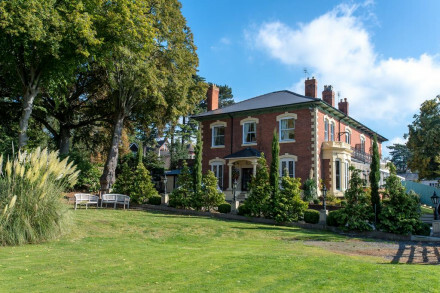 Castle House is Hereford’s only luxury boutique hotel and is owned by a local farming family. The staff is known for its friendliness and going the extra mile to ensure guests and visitors are looked after. Each of the 24 bedrooms has been individually designed and furnished. Guests have the option of staying in the Grade II listed main house or just a few yards away in an eight bedroomed townhouse, Number 25. Hereford is an old historic city with much to do and see. Castle House is just a few minutes’ walk from Hereford Cathedral which houses one of the world’s oldest maps, The Mappa Mundi, as well as a signed copy of the 1217 Magna Carta – the foundations of our law and the American Constitution. It is a small city surrounded by beautiful and unspoiled countryside where there is much to do and discover. Full, English Breakfast is on offer every day but obviously we offer fresh fruit, yogurt and a Continental breakfast as well and happy to organise special meals. We have a two-rosette restaurant and a bistro which are the domain of Head Chef Claire Nicholls. Some of the fresh vegetables, fruit and herbs come from the owner’s Ballingham Farm where they also rear pedigree Herefords and rare breed sheep. Castle House is open every day for breakfast, lunch, afternoon tea, dinner and, of course, throughout the day for snacks and coffees etc. We have a beautiful ‘secret’ garden which is just beside the old Hereford Castle moat and very popular with locals and those who find it quite by accident. There are other good places to eat out locally and we do certainly recommend those we think our guests would like. Every room has been individually designed so offers a unique experience. All have ensuite bathrooms, fresh fruit, a decanter of sherry, fresh milk and tea/coffee making facilities. We have Gilchrist & Soames toiletries. One of the most popular rooms is the King Charles II Castle Suite which runs the whole width of the house and is more like an apartment. On the whole most of our rooms are popular but our Fourposter Royal Suite is much requested by honeymooners. Number 25, our townhouse, is very popular with people who like to be a bit more independent and weekenders who like to have a lie in. We have two suites on the ground floor which have small conservatories and guests can eat outside in a pretty, secluded garden and pick apples from the old apple tree (when in season!). Facilities would include our private garden and there is a local museum lots of shops etc. nearby. We can offer Z beds in most rooms and some of our Castle Suites have sofa beds so ideal for families. We have a fridge in each room with fresh milk and ideal for storing food/drink etc and we offer travel cots and high chairs. No 25 Townhouse is perfect for exclusive use "house parties"